Consider all of the issues Henrik Ibsen broaches in “An Enemy of the People,” and you might think he was writing in the 21st century rather than in 1882. Parallels include using scientific evidence as a political tool; a community divided by polar factions; a fickle, self-serving, unreliable press; putting immediate over long-term good; delaying repairs so a situation gets worse; immediate gratification vs. well-earned reward; and scapegoating an individual, particularly, a whistleblower while ignoring the problem he is exposing. Although the 1882 Norwegian coastal town of “An Enemy of the People,” may be more parochial, and more effectually democratic, than cities today, its political and social dynamics match many a current burg in its insularity and willingness of the many to jump on the bandwagon of the few without examining specific issues at hand. Ibsen, writing 133 years ago, is as fresh a May 2015 headline, and Susan D. Atkinson, by keeping Bristol Riverside Theatre’s production of “An Enemy of the People” clear and straightforward, touches on all the similarities between 19th century Norway and the contemporary United States. Nuance comes within characterizations, especially in the performances of P. Brendan Mulvey, Marc LeVasseur, and Keith Baker. In general, Atkinson, aided by assistant director, Amy Kaissar, choose immediate, sharp understanding over subtlety or depth. “An Enemy of the People” depicts a pitched battle over a crucial issue, one that literally involves life and death, and Atkinson draws distinct lines between its adversaries, brothers Thomas Stockmann, a physician and the medical director of therapeutic baths that draw a flock of tourists, and Peter Stockmann, the town’s mayor who wants to protect the town’s revenue and prosperity even if they are gained by jeopardizing the health of innocent others. Atkinson doesn’t make her Bristol audience guess which side to take. She eliminates any ambivalence Ibsen may have built in and goes headlong in the arena, showing along the way the fragile mutability of public opinion and how easily a hero can be branded a villain, one who is persecuted and hounded beyond the level at which he was once cheered. Ibsen leaves a major clue to tell you which Stockmann brother is right, so it becomes even more interesting to see the arguments that develop and the mayhem that ensues given one person seems to have all of the trumps in his hand. Atkinson lets Ibsen operate at face value. She doesn’t sugarcoat or embellish. She lets the most salient fact speak for itself while dramatically staging the conflict that goes on and the political path it takes. This is strong theater because so much is at risk, and so much militates for the guarded, sophistic, and expedient to prevail over the authentic assessment of a dire situation. Atkinson’s plain approach, acquitted well and spiritedly by Kevin Bergen as Thomas and Brian Drillinger as Peter Stockmann, lets you grasp the matter at hand, whether the baths that are economic lifeblood of an otherwise struggling town should remain open when it’s understood they are afflicting people with typhus and other bacterial diseases, while transparently revealing the maneuvers politicians in particular use to sway opinion and gain public support. Right or wrong isn’t the debate so much as personal interest vs. common good in the wake of an event that might interrupt prosperity but could prove calamitous and, if examined to its full extent, criminally immoral. Atkinson and Kaissar have enhanced the atmosphere in which groups are cajoled, persuaded, and manipulated by enlisted a cadre of Bucks County community members who play small background roles but come together as a mob when Thomas calls a town meeting to wrest an opportunity to deliver and explain his full report about the baths. The community ensemble, which includes a professional actor, Richard Blanck, fulfills its mission. They enliven the Stockmanns’ town and form a formidable rabble at the pivotal meeting that decides several fates. Everything in Atkinson’s production conspires to bring the Stockmann-led debate forward, to the point of being constantly front and center so the Bristol audience can glean all the evidence and get involved in the issue at hand and its outcome. Other threads, like Thomas Stockmann’s domestic life, the connivance of the press, and the alternative view of finance represented by Thomas’s father-in-law, the wily Morten Kiil, are addressed and are as visible and traceable as the main plot while being subordinate to it. Atkinson prefers to concentrate on the pollution issue, and political manipulation, and let the other aspects of “An Enemy of the People” fill in as color and texture rather than being heightened in a way that might distract or confuse. The production is meant to show the bustle in Thomas Stockmann’s household, which is a veritable center of society with people from several walks of life dropping in for a share schnapps and a roast beef dinner or coming to discuss serious town business. Thomas Stockmann is a vigorous member of his hometown community, one he feels privileged to live in after practicing medicine for years in Norway’s rugged and hardscrabble north. In addition to treating patients, he has pet scientific projects and is a prolific writer for a progressive newspaper, The Daily Herald. Its editor, Hovstad, is a regular visitor of the Stockmanns, as is its lead reporter and ambitious assistant to Hovstad, Billing. Official business is represented by Peter Stockmann, a bachelor of ascetic cast who drinks weak tea and eats only bread and butter to help control a fidgety stomach and who thinks his brother’s expenditures, especially on entertaining others, to be extravagant. Peter is not amused when Thomas blithely tells him his wife, Katharine, says Thomas earns almost as much as they spend. Peter has at times supported the libertine Thomas. Already, you have a fulsome, energetic, industrious brother contrasted to a sober, conventional one. The brothers have in common their attention to their duties. Peter does not take his position as mayor lightly, as you can by the way he preens over the symbols of that office, a hat and walking stick that approximate a crown and scepter. When we meet Thomas, he is anxious because a letter he awaits from a prestigious Norwegian university has not yet arrived. Thomas has written a piece for Hovstad to print about the baths, but he wants the editor to hold it longer as he has a suspicion the baths are not a salubrious as they are advertised to be and might, in fact, be laden with bacteria that can prove fatal and probably has already. The letter comes home with Stockmann’s daughter, the overworked teacher, Petra, who delivers it to her father’s delight. With Hovstad, Billing, another neighbor, Captain Horster, and the activist Petra present, Thomas announces that his suspicion about the baths being tainted has been confirmed by expert chemists at the university. Petra congratulates him, not only on his curiosity, experimentation, and care in getting a conclusive report, but for his prescience. Thomas anticipated the pollution problem and devised a remedy for it before the plumbing for the baths was begun. He was overruled in his deliberations and proposals by Peter and others who said the cost of the baths might be too dear if Thomas’s design was used. Now it appears 200,000 or more kroner will be required to fix the baths and make them the healthy, restorative site they could be. Thomas and Peter also have a point of contention about which brother discovered the baths’ potential. Thomas is the one who realized the baths’ worth and wrote the initial proposal to build them. Peter, being the more organized brother and a better politician, pushed the project through city government. Katharine suggests they share credit, but being brothers, sibling rivalry, mostly Peter’s, kicks in and precludes such a happy solution. Peter is now the chairman of the baths. Thomas is its chief medical officer. Both have much at stake in the baths being an evolving success. Everyone is their town does. The tourists’ kroner fuel the town’s economy and keeps tax rates low. Small businessmen and householders, represented by Mulvey’s beautifully played Aslaksen, a printer and civic leader, appreciate all the baths have done and are big supporters of the brothers’ pet spa. The university report says the baths are infected with millions of germs, discountable by doubters because they are invisible and can only be seen under a microscope. Thomas’s father-in-law, Morten Kiil, gets a kick out of this. Peter Stockmann and others uses the unseen microbes as ammunition that Thomas is exaggerating the danger caused by the baths and maintains their healthy minerals by far outweigh any damage exposure to unnoticeable bacteria can be. Hovstad, Billings, and Aslaksen all pledge support for Thomas, which means press and community support, when they hear of the university findings and learn Thomas has a plan to fix the baths. They do not know yet, as Thomas does, the baths will have to be closed for two years and cost all those hundreds of thousands of kroner to repair. Peter Stockmann is more than happy to tell them about it. Peter paints a bleak picture of poverty that will replace the town’s prosperity if the lucrative baths are shuttered for two years. He warns that neighboring towns will open competing baths and that his town will never attract a flow of visitors, especially if people have a lingering idea, true or not, that the baths once tainted cannot be made healthy again. Aslaksen, a champion of moderation, worries that Thomas is going too far in his campaign to shut the baths in order to fix them. The hard times Peter projects for the small businessman and householder does not suit him at all. He begins to question Thomas’s report and its proof. Hovstad, who has had his own political motives for disgracing Peter and all of town government and supporting the firebrand Thomas, has his doubts. Peter makes a convincing case. If businesses lose money, they can’t afford to advertise, and The Daily Herald will go bankrupt. Besides, Peter is changing the common tide of the townspeople. Spending 200,000 kroner doesn’t suit them. They wonder if Thomas is too doctrinaire, too stubborn in warning about health dangers and insisting the baths be totally closed. Billing, who has political ambitions, goes along with his publisher and editor and becomes one of the loudest and most taunting opponents to Thomas, even though he is enamored of Petra, who shows signs of sharing his interest. Facts give way to sentiment. Battle lines are drawn, and sides are fervid and unyielding. Hovstad will not print Thomas’s report in The Herald. People rail against it. Aslaksen declares it immoderate. Peter brands it a tissue of lies and moral hysteria. The problem is no one but Thomas, Peter, and Hovstad have read the complete report, and Hovstad only because he was preparing it to publication. Peter’s appeal to the public is through their purse, the factor that sways Aslaksen, Hovstad, and others as well. Even Katharine is worried about domestic finances, especially if Thomas loses his job at the baths and his practice’s patients, as Peter promises he will. Katharine, like others, thinks first of her three children and home, especially her two young sons, Eilif and Morten. Ibsen doesn’t let Peter’s appeal to public sentiment to be challenged much. He stacks the deck against Thomas in ways that are as literary as they are dramatic. We, the audience hear how Thomas sent samples of the water that feeds the baths’ pipes to the university to test their safety for bathing and drinking. In “An Enemy of the People,” Peter is the only one who sees the university document. Thomas is effectively barred from sharing it with anyone else. Even Hovstad goes by Thomas’s article and doesn’t look at the primary research. One wonders why nowhere in the text Ibsen lets an arguing Thomas cite the document that convinced him he was right about the baths’ danger. We know he withheld writing the piece for The Herald until he received the information that corroborated his surmise. Except for the time we see the university evaluation in Thomas’s hands, we never hear about it again. Ibsen lets it be Thomas’s word and against Peter’s, with Peter glomming all sentiment from a public that doesn’t want to be poor again. Thomas sounds as if he’s speaking from intuition, that he’s guessing the baths are foul because visitors from the previous year died from typhoid fever and other bacterial diseases. It’s curious that Ibsen never gives Thomas the chance to present his hard evidence. Like Atkinson, the author seems more interested in the phenomenon of mob rule, and how easily the public can be hoodwinked into thinking its self-interest lies in the expedient rather than the considered and long-term. Ibsen also doesn’t give Thomas the chance to speak and present the university substantiation at a meeting he calls expressly to reveal all he knows and give the report Peter, Hovstad, and Aslaksen are suppressing. Thomas, who no one will allow to rent a public hall to give his report, accepts the generosity of Captain Horster to use a large vacant room in his house, and he has his gathering co-opted by Aslaksen and Peter. Rather than assert he called the well-attended meeting for a definite purpose, Thomas succumbs to the town request the gathering be moderated by a chairman and governed by parliamentary procedure. He doesn’t stand his ground or insist he convened the meeting and will follow his intended agenda. The Stockmanns’ town seems more like a Jacobin stronghold during the French Revolution when mobs practiced anarchy and literally stopped opponents with the guillotine than a civilized place bringing organization to a gathering. Thomas’s tirade truly sends sparks flying. The town is in uproar, Aslaksen moving that Thomas be declared “an enemy of the people.” He leaves the gathering he entered so hopefully to his neighbors chanting that phrase over and over again. “An Enemy of the People” is a cautionary tale of democracy gone amok. Its characters reduce serious matters to political footballs that are kicked around in circles until one compromising side, assuming there is a compromising side, until the more persuasive rules the day, usually more because of sentiment than facts. Only Thomas and Petra Stockmann remain above the fray, and they are the most punished and vilified. Susan D. Atkinson makes it easy for her audience to follow even the most complex passages, such as the one in which Morten Kiil has gleeful fun buying up shares to the baths at vastly discounted prices. Kiil, oddly, is in a position to singlehandedly fix the baths, and reap all of the profits because of all the shares he is glomming from people all too willing to sell their holdings short. The direct approach takes away some majesty and intensity from the play, but it doesn’t diminish its power. The accessibility makes it easier for more people to weigh in for or against Thomas or to be outraged at the campaign launched against Thomas. Kevin Bergen and Brian Drillinger make excellent leads, but in Bristol they are overshadowed by some of the supporting characters who are given more distinct traits and are wilier with their presentations. Keith Baker is particularly entertaining as a firm, curmudgeonly, but constantly amused Morten Kiil. The way he teasingly grills Thomas in their first scene together is a masterpiece of a fox laying waste to the most docile of chickens. Baker is especially good in the bit where he keeps reducing the amount to money he will donate to charity if Thomas can convince Peter the baths need immediate closing and renovation. The joy Baker shows in the scene in which Kiil takes advantage of the town’s attitude and buys up the baths shares is quite contagious. We know Kiil is a old scoundrel who will seize the best chance while others are haggling over minutia and unimportant details. Brendan Mulvey is the picture of middle class respectability and overweening self-pride as Aslaksen, the community leader who wants everything done in moderation. Mulvey endows Aslaksen with authority and speaks in a voice that commands attention and respect. The actor brings out the seriousness and pomp in Aslaksen’s character. This man wields a lot of power, and he knows it. If Thomas is an enemy of the people, and Peter is a leader of people, Aslaksen is the people’s representative, the one who expresses their wishes and makes sure others abide by what he determines the people want. Mulvey’s is a true portrait of the honest burgher. Head held high, voice firm and emphatic, he speaks for masses, and it behooves people to heed and appease him. His umbrage will only lead to damage. Marc LeVasseur makes look Hovstad look and sound cosmopolitan and in tune with world politics, but when its comes down to it, this handsome, confident man is a duplicitous weasel who is more interestied in breaking down structures than building or reinforcing them. He shows the stripes of the crusading journalism until his livelihood is threatened and he goes in a more conciliatory direction. Kevin Bergen is a gregarious, enthusiastic Thomas. Everything interests him, and his general demeanor is one of pent-up energy that needs some vent. Thomas is an industrious character, always thinking and working, and Bergen expresses that otherworldliness. In general, Bergen conveys Thomas’s many moods and rampant creativity well. He can put more fire in the first half of Thomas’s speech excoriating the masses. Thomas’s change of pace when you’re hoping to hear his evidence at last is confusing even though understandable when you account for the way his meeting was commandeered and his facts found no ready audience. Bergen is good at showing how oblivious and absentminded Thomas can be. In one scene, Aslaksen mentions twice he is the head of the town’s temperance league, and Thomas goes on to offer him an alcoholic beverage and when that is refused, offers a beer. He also demonstrates the love Thomas had for his family and the conviviality that goes along with his restless mind. Brian Drillinger exudes some charm at Peter. You can see how he can forgo his basic taciturnity and standoffishness to inveigle a crowd. Peter is crisp and clipped in his conversation, and Drillinger lets you see the disdain he has for Thomas when the younger brother refuses to relent and go along with his plan. Shamus Hunter McCarty shows his ambition as Billing. He also shows a smallness and vindictiveness that could help or hinder him in office. Billing professes to be a liberal, but you can see he will go wherever the opportunity is best, standards or consistency be dashed! Sabrina Profitt does well as Katharine, the woman who tries to keep peace between the brothers, and earns Peter’s respect for it, but who stands with her husband even when his singlemindedness threatens to destroy her home. Laura Giknis presages the knowledgeable, independent woman to come as Petra, proudly loyal of her father from the get-go and nobody’s fool around flirting men. Among the community ensemble, Nathan Esser stands out for his sharp readings as young Morten Stockmann, Richard Blanck for his command as Mr. Vik, a ship owner, and Stan Karuzis as a disruptive drunkard. Mark Collmer is solid as the sea captain, Horster, who is at home on water than on land and doesn’t care much for politics. That indifference would make him unusual in Norway of 1882. That was the year the Norwegian legislature, the Storting successfully sued Norway’s ruler, the King of Sweden, and gained the right to self-govern by being able to overrule measures the king imposes on Norway, war and taxes in particular. The upheavals of 1882 led a scheduled general election in 1884 in which Norwegians would choose representatives to a new Storting, the first that would have primary responsibility in governing the country. Liberals and conservatives lined up in opposition to one another. Political participation was rampant, and it was a rare man who wasn’t interested in exercising a new-won franchise. Women were vocal although they could not vote. Norway was the first country to grant women suffrage, in 1913. Ibsen’s audience in 1882 would be politically minded, and there had to be factions among them who would have agreed with Thomas’s excoriation of mob, or even majority, rule, and other who would be happy if anarchy flourished. Brian Johnson and Rick Davis’s translation of “An Enemy of the People” was accessibly colloquial and sounded naturally conversation as opposed to overlade with speeches and lofty sentiments. Jasons Simm’s set in the open framework of a house that symbolizes the Thomas Stockmann’s tenuous and the open honesty that prevailed under his roof. 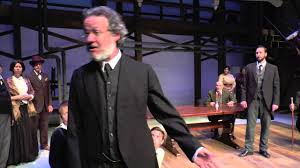 “An Enemy of the People” runs through Sunday, May 31, at the Bristol Riverside Theatre, 120 Radcliffe Street (Radcliffe and Market), in Bristol, Pa. Showtimes are 7:30 p.m. Wednesday and Thursday, 8 p.m. Friday and Saturday, 2 p.m. Wednesday and Saturday, and 3 p.m. Sunday. Tickets range from $46 to $36 with discounts available and can be obtained by calling 215-785-0100 or by visiting www.brtstage.org. This entry was posted on May 24, 2015 by nzoren in Theater Reviews and tagged Amy Kaissar, An Enely of the People, Brian Drillinger, Brian Johnson, Bristol Pa., Bristol Riverside Theatre, Classic, Comedy, Henrik Ibsen, Keith Baker, Kevin Bergen, Laura Giknis, Marc LeVasseur, Mark Collmer, P. Brendan Mulvey, Philadelphia Theater, Rick Davis, Sabrina Profitt, Shamus Hunter McCarty, Susan D. Atkinson.